I made this last night.It has a nice light texture and rose well while baking.Quick to make and it tasted very good too!I added an extra teaspoon of xanthan gum to batter.If the recipe is doubled for a two layer it would make a nice birthday cake. Heat oven to 350.Grease and "flour" 8-inch square baking pan.Set aside. Stir together flour blend,baking powder and salt in large bowl.Set aside. Beat 3/4 cup sugar and 1/2 cup butter in large bowl at medium speed,scraping bowl often,until creamy.Add eggs one at a time,beating well after each addition.Stir in vanilla.Reduce speed to low.Add flour mixture alternately with milk,beating well. Place one cut batter in small bowl.Add remaining 2 tablespoons sugar,2 tbls.cocoa and water;stir until well mixed. 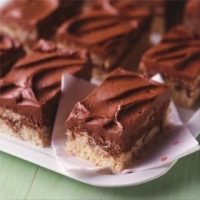 Spoon 3/4 plain batter into bottom of prepared pan.Spoon chocolate batter over plain batter.Spoon remaining plain batter on top,allowing some chocolate batter to show through.Swirl batters together gently with knife or spatula for marbled effect. Bake for 25-30 minutes or until toothpick inserted comes out clean.Cool completely. Beat 1/4 cup butter in medium bowl at medium speed until creamy.Gradually beat in powdered sugar,1/3 cup cocoa,vanilla and enough milk for desired spreading consistency.Frost cooled cake. Gluten Free Flour Blend:2 cups rice flour,2/3 cup potato starch,1/3 tapioca flour,1 tsp.xanthan gum-combine all ingredients in large bowl.Store in container with tight fitting lid,stir before using. My girlfriend will love this...Im going to send it to her. She has to cook everything gluten free due to her little girls allergys. Thank you! It looks great!